Nobody is born a hero, but anybody can become one. 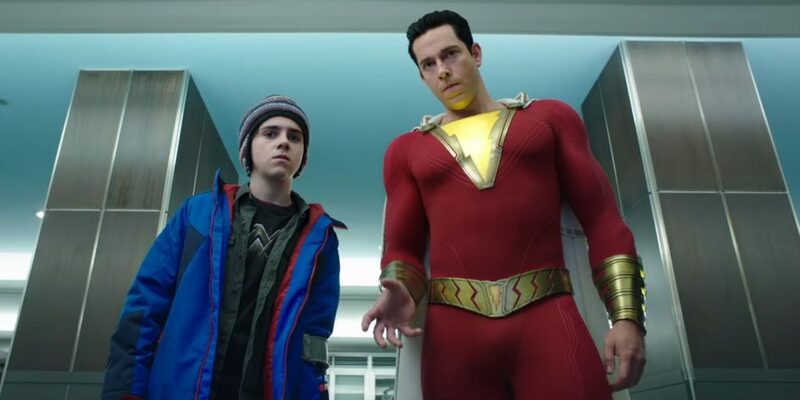 This sentiment saturates DC’s latest film, Shazam!—a teen-friendly flick that follows the journey of a 14-year-old boy who is suddenly, and magically, transformed into a buff, crime-fighting superhero. Directed by horror filmmaker David Sandberg, the film attempts to bridge the gap between quick-fire slapstick comedy and actual character development. While it frequently misses the mark, Shazam! still crawls out as a messy but tolerable addition to the DC universe, producing a number of sincere laughs and heart-tugging moments. Sandberg’s horror-based influence is on display from the opening sequence. His works, which include Lights Out (2016) and Annabelle: Creation (2017), frequently deal with themes of childhood and family and how the events of our past play a role in shaping who we grow up to be. In Shazam!, the audience learns the origin story of the villain, Thaddeus Sivana (Mark Strong), rather than that of the hero. During an argument with his father and older brother, a young Sivana is suddenly transported to the Rock of Eternity—a magical temple controlled by the elderly wizard Shazam (Djimon Hounsou). Yes, his name is Shazam. Shazam is responsible for keeping evil at bay after his first apprentice went rogue and unleashed the Seven Deadly Sins upon humanity. The Sins are now trapped in statues, waiting to be set free. When the Sins tempt Sivana into the promise of power with a glowing orb, he fails Shazam’s test to prove that he is pure of heart. This leads to his return back to Earth and the beginning of his frustrating search for a way to once more enter the Rock of Eternity. Sivana’s quest becomes intertwined with Billy Batson’s search for family and belonging. While an adult Sivana hunts for answers, the young Batson (Asher Angel), living in Philadelphia, is in determined pursuit of his mother, whom he was separated from at an early age. After his antics get him kicked out of numerous foster homes, Batson finds himself under the care of sunny foster parents Victor and Rosa Vazquez (Cooper Andrews and Marta Millins). He encounters group of young misfits, which include the bright and charming Darla (Faithe Herman), as well as his nerdy roommate Freddy (Jack Dylan Grazer). A weakened Shazam brings the strong-willed Batson to his temple and insists that he take on the role of champion. His new powers allow him to transform into an adult superhero (Zachary Levi) without losing his prepubescent mentality. While the adventures that follow are predictable, they do not detract from the winning, comical duo of Levi and Grazer. Batson’s transformation into an attractive adult man leads the two to indulge in “adult” warfare, including stopping crime, visiting strip clubs, and buying alcohol. Shazam! is a Princess Diaries-esque transformation story in which Batson has to choose between his newly discovered powers and the people he cares about. Yet, the film eventually loses its awkward, endearing charm. Sivana re-enters the scene with the power of the Sins behind him, hungry for Batson’s inherited powers. While initially a nuanced character with a compelling origin story, Sivana loses his appeal, instead becoming a simplistic caricature, motivated by blind ambition, rather than a man searching for belonging. Batson’s family narrative takes precedence at the loss of Sivana’s complexity. The villain’s lust for glory and vengeance becomes laughable as he and Batson engage in a flying battle above Philadelphia. The Seven Deadly Sins are unconvincingly animated, appearing like ugly gargoyles that fail to match the characteristics they represent as creatures that encapsulate the worst parts of humanity. Shazam! screams lost potential. Freddy never grows past feeling frustrated and envious of his roommate’s superhuman abilities. Darla is adorable but one-dimensional. There is too much discrepancy between Angel’s child Batson and Levi’s adult Batson. Levi’s performance seems to depict an entirely different character—one that is juvenile, hormonal, and, frankly, rather irritating. Yet, it is Angel’s performance that is truly worthy of Shazam’s powers. Torn between settling in with a foster family that wants him or chasing his fantasy of finding his biological mother, Angel showcases anxieties about belonging and identity, giving him an enticing vulnerability. The most important takeaway from Shazam! is that home is not a location, but a sensation, defined and curated by the people and the love that surrounds us. It passes as an underdog story of a lost boy turned into a man. It is ultimately not the “super” element of Shazam! that makes it appealing, but instead the glimpses of family underneath its commercial structure. Superhero films have the power to affect our perception of the world we live in; they manifest unexplainable evils into tangible villains and transform the best parts of human nature into heroic qualities. They show us that anybody has the potential to tip the scale. Shazam! could have ushered in a new era for DC: one that combines humor with humanity and heart. While it fails to fully deliver on that task, Shazam! gives us a tantalizing insight into the possibility of a fresh, relatable DC superhero—one that we can find inside all of us.